Today is the birthday (1902) of Julian Haynes Steward, a Boasian anthropologist best known for his role in developing the concept of cultural ecology, as well as a theory of culture change. He’s not one of my heroes, but then, few Boasians are these days – oops, I’m a Boasian too, but a maverick sort of one. My pedigree goes back to Boas through Kroeber as does Steward’s, but my lineage is a generation or two longer, and some weird genetic material crept in along the way. Steward was born in Washington, D.C., but at 16 he went to a boarding school in Deep Springs Valley, California, in the Great Basin, high in the White Mountains which had a significant influence on his academic and career interests. As an undergraduate, Steward studied for a year at Berkeley under Alfred Kroeber and Robert Lowie, after which he transferred to Cornell University where he graduated in 1925 with a B.Sc. in zoology. Although Cornell, like most universities at the time, had no anthropology department, its president, Livingston Farrand, had previously held an appointment as a professor of anthropology at Columbia University. Farrand advised Steward to continue pursuing his interest in anthropology at Berkeley. Steward returned to study under Kroeber and Lowie and received his Ph.D. in 1929. Steward went on to establish an anthropology department at the University of Michigan, where he taught until 1930, when he was replaced by Leslie White, whose model of cultural evolution went on to become popular and gained the department fame/notoriety. 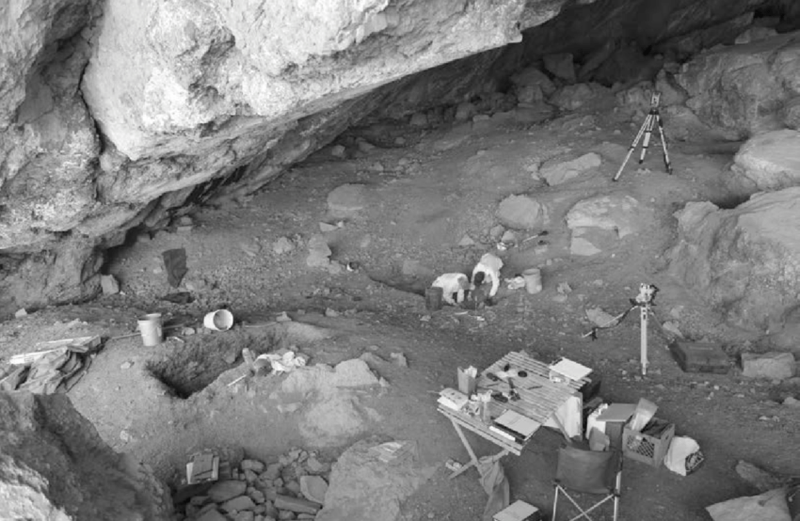 In 1930 Steward moved to the University of Utah, which appealed to him for its proximity to the Sierra Nevada, and nearby archaeological fieldwork opportunities in California, Nevada, Idaho, and Oregon. Steward’s research interests centered on the dynamic interaction of humans with their environment, technology, social structure, and the organization of work. 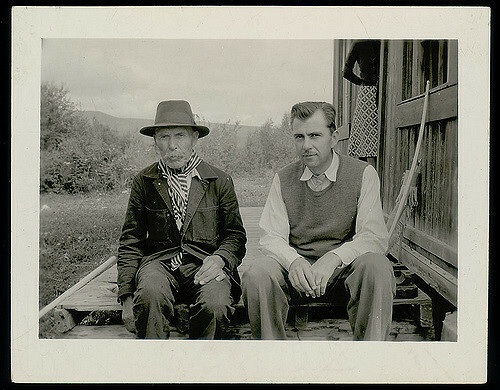 In 1931, Steward began fieldwork on the Great Basin Shoshone under the auspices of Kroeber’s Culture Element Distribution (CED) survey, and in 1935 he received an appointment to the Smithsonian’s Bureau of American Ethnography (BAE), which published some of his most influential works. Among them, Basin-Plateau Aboriginal Sociopolitical Groups (1938), which laid out Steward’s model of cultural ecology. Steward searched for cross-cultural regularities in an effort to discern laws of culture and culture change. His work explained variation in the complexity of social organization as being limited to within a range of possibilities by the environment. Steward’s most theoretically productive years were from 1946–1953, while teaching at Columbia University. At this time, Columbia saw an influx of World War II veterans who were attending school thanks to the GI Bill. Steward quickly developed a coterie of students who would go on to have enormous influence in the history of anthropology, including Sidney Mintz, Eric Wolf, Roy Rappaport, Stanley Diamond, Robert Manners, Morton Fried, Robert F. Murphy, and influenced other scholars such as Marvin Harris. Many of these students participated in the Puerto Rico Project, yet another large-scale group research study that focused on modernization in Puerto Rico. Steward left Columbia for the University of Illinois at Urbana-Champaign, where he chaired the anthropology department and continued to teach until his retirement in 1968. There he undertook yet another large-scale study, a comparative analysis of modernization in eleven third world societies. The results of this research were published in three volumes, Contemporary Change in Traditional Societies. Let’s look at the diet of the Paiute, a group Steward studied extensively. They were foragers and a substantial portion of the intake was grass seeds, including rice grass, also known as sandgrass, Indian millet, sandrice and silkygrass. Rice grass occurs naturally on coarse, sandy soils in the arid lands throughout the Great Basin. They also foraged for tubers and greens, including cattail sprouts, and for berries and pine nuts. The seeds of rice grass were ground into meal. Whenever possible they fished and hunted, especially for migratory ducks. Today, though, I want to focus on wild rice. The species most commonly harvested as grain are the annual species: Zizania palustris and Zizania aquatica. The former, though now domesticated and grown commercially, is still often gathered from lakes in the traditional manner, especially by indigenous peoples. 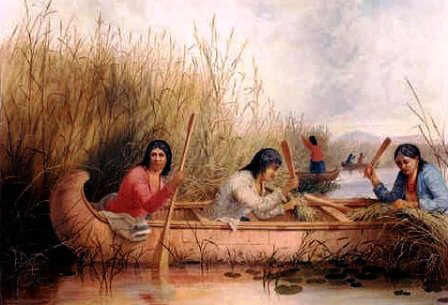 They harvest wild rice by canoeing into a stand of plants, and bending the ripe grain heads with two small wooden poles/sticks so as to thresh the seeds into the canoe. One person knocks rice into the canoe while the other paddles slowly or uses a push pole. Some seeds fall to the muddy bottom and germinate later in the year. You cook wild rice much like brown rice. Put 3 parts water to 1 part rice in a saucepan, bring to a boil, lower the heat to a simmer, cover, and cook for 40 to 45 minutes. The rice is ready when the hulls split open.